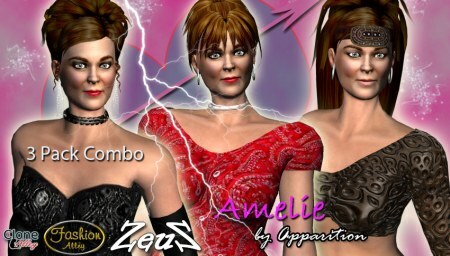 Description: Amelie was modelled in 3dsMax to be a slightly more buxom woman, with healthy proportions as compared to Gwynn. The other unique feature is he removed polys from the skin under the clothing, thus reducing the poly count and using less resources in iClone which is particularly important when using multiple characters. The Warrior version comes with pre-cut cloth base with polys removed underneath for lower poly count. Texturing is effortless by adding a pattern or launch your photo program for more detailed texturing. The Formal Version comes with a gown with polys removed on the skin lower (bonus gown with skin left in also). The Business Version comes with 5 textured business avatars, along with the dress cloth base with both skin removed and skin left in. Also note that you can add your G5 Clone Cloth uppers and lowers to Amalie and she retains her healthy body proportions. Thank you Mister ZEUS !! !